When we think of colour in Street Photography we usually remember names such as Alex Webb, Martin Parr and William Eggleston. I believe that we should add Narelle to that list, because the way she understands colour can only be characterised as masterful and her compositions are so well thought out, one could easily argue that she is a master photographer. 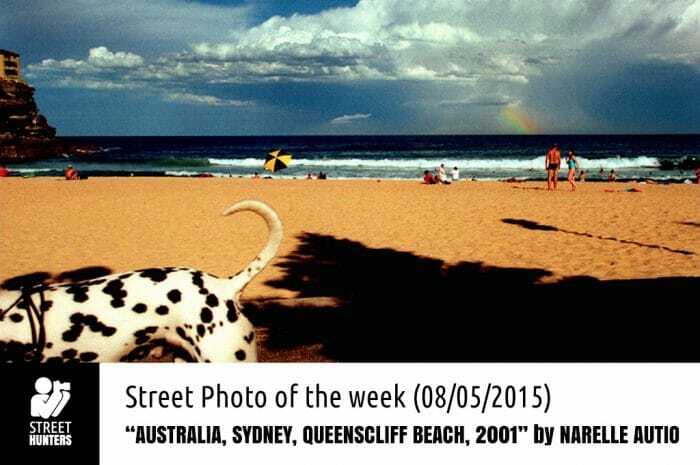 Narelle Autio is a member of the iN-PUBLiC collective that includes many talented photographers such as previously featured “Street Photo of the week” photographers, Mark Powell, Trent Parke, Matt Stuart, Maciej Dakowicz and Blake Andrews. She is also a member of VU’ an agency of photographers. You can see more of Narelle Autio’s photographic work on her profile on the VU’ website and of course on her dedicated page on the iN-PUBLiC collective website. 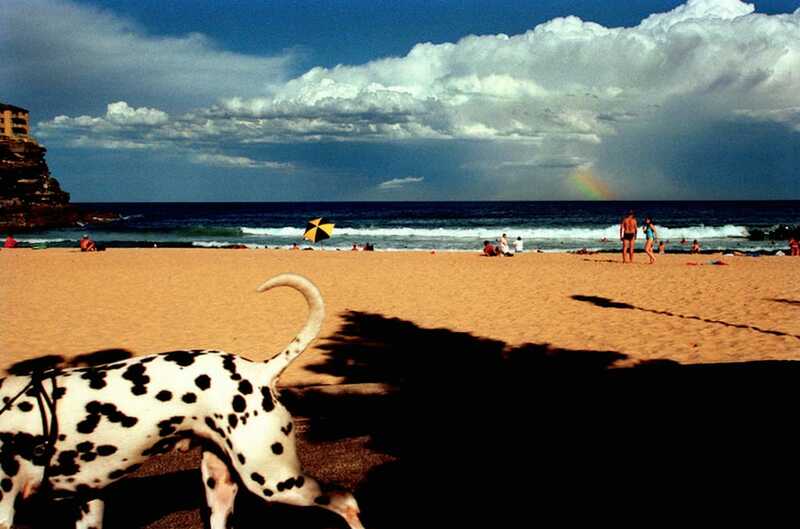 Looking at this photo one can understand why Narelle Autio is so good at using colour, light and shadows in her work. This composition is simply amazing. The landscape in the background is majestic, the thick white clouds, hovering over the dark sea connected by a colourful rainbow. Looking at the rainbow the eye then continues downwards towards the people standing on the beach. A small story is being told there, in that corner of the photo. As the eye zooms out of the couple, it follows the expanse of the sand downwards, until it reaches the tip of that thin black shadow that leads the eye lower even to the big shadow that dominates the right hand corner of the photo. While looking at the shadow, suddenly a body of a Dalmatian dog comes into play and seems as if it is exploding out of the photograph, but at the same time it is stopping the shadow from advancing any further. The curve of the tail of the dog seems to be blocking the growth of the top left part of the shadow and the black spots on the white body of the animal give an undoubtedly surreal feel to the photo. But the eye goes around in circles and from the tail of the dog, bounces off to the final focal point which is the black and yellow umbrella on the mid left which reminds me of a Toxic Waste sign. Ha! Toxic Waste at the beach! How surreal!